Goals of the NSF-funded “All Cypriniformes Species Inventory,” that began in September, 2010, are to (1) accelerate the rate of discovery and description of cypriniform fishes and improve our understanding of their evolutionary and ecological relationships, (2) make information on cypriniforms readily available in print and electronically via websites with virtually all taxonomically relevant information, (3) build the capacity for systematic research in other countries through student training and establishing long-term collaborations, (4) make available large numbers of specimens and tissues of freshwater fishes, including those of species never before collected, in permanent collections of US and foreign institutions, and (5) expand our knowledge of the phylogenetic relationships of Cypriniformes and construct a predictive classification by adding 1,000 species to the phylogeny from the Cypriniformes Tree of Life. “All Cypriniformes” brings together PIs of the NSF-funded “All Catfish Species Inventory (Siluriformes) – Phase I of a PBI of the Otophysi,” and the NSF-funded “Cypriniformes Tree of Life” project to maintain the momentum of the global inventory of freshwater fishes. A team of collaborators that includes 57 scientists and students from 24 countries has been assembled. More collaborators will be added as the project progresses. A website, Cypriniformes Commons (www.cypriniformes.org) provides information on goals of All Cypriniformes, taxonomic diversity, and contact information for collaborators, pdfs of literature relevant to species descriptions, photos of living or preserved representatives of species, diagnoses of taxa and guides for identification, images of primary types, and links to other cypriniform-relevant projects. All Cypriniformes has a cybertaxonomy element in the form of (1) an online taxonomy portal, Profiles, for developing “leaf pages” for the Tree of Life and Encyclopedia of Life, (2) Taxon Tracker, for community participation in review of taxonomic issues, (3) a series of online forms for collaborators to write species descriptions, thereby enabling rapid and standardized descriptions, and (4) databases of geometric morphometrics, traditional morphometrics, and meristics to facilitate and maintain comparative data for online key development. 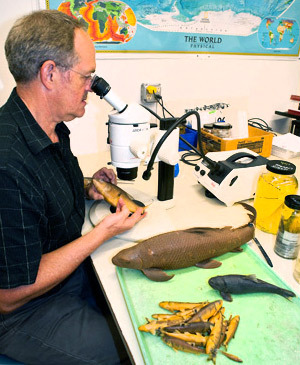 Given the large numbers of specimens in museums to be examined by collaborators and the tropical regions to be sampled during this PBI, it is certain that many species of freshwater fishes will be discovered and described. Fieldwork in All Cypriniformes is expected to yield at least 300,000 specimens of 5,000-6,000 species of fishes and 10,000 tissue samples for molecular analyses. It is anticipated that 800-1,000 new species of cypriniforms will be described.